Crain's Chicago Business is reporting Cook County foreclosures on pace to smash last year's record. After the number of failed home loans hit a record in 2007, foreclosure filings in Cook County are on pace to top last year’s total by another 35%, based on the first two months of the year. Some 7,361 foreclosure cases were filed in Cook County Circuit Court in January and February, up 58% from 4,668 during the year-ago period, reports Dorothy K. Kinnaird, presiding judge of the court’s Chancery Division, which handles foreclosures. Projecting the level of filings out for a full year would yield more than 44,000 foreclosure filings in Cook County in 2008, up about 35% from last year, she said. Cook County’s 2007 number was a record for the county, representing a 47% increase from 2006 when the county’s court system processed 22,248 foreclosure filings — also a higher-than-normal total. Chicago is one of the cities that Calculated Risk plots. 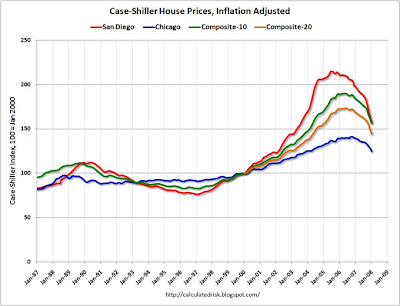 Let's take at his latest chart from Real Case-Shiller House Price Index. For those in Cook County it would seem that prices did not get nearly as far out of line as San Diego or even the top 10 and top 20 composites. Wikipedia notes on Cook County: "Chicago makes up about 54% of the population of the county, the rest being provided by various suburbs. Cook County is the 19th largest government in the United States." Calculated Risk writes: "Looking at this graph, I'd guess prices have fallen somewhat less than half way (in real terms) to the eventual bottom. Also look at the length of the housing bust in the early '90s. It took over six years from peak to trough in some cities. If this bust takes the same amount of time, prices will not bottom in some cities until 2012 (or there about)." I arrived at the same year via a different methodology. Please see Housing - The Worst Is Yet To Come and When Will Housing Bottom? for details. For an updated look at Florida, ground zero of the housing bubble bust, please read Grown Men Are Crying In Florida. It's a pretty shocking composite. Chicago is a cake walk in comparison.